Regenerative medicine is a distinct major advancement in medical treatment which is based on the principles of stem cell technology and tissue engineering in order to replace or regenerate human tissues and organs and restore their functions. After many years of basic research, this approach is beginning to represent a valuable treatment option for acute injuries, chronic diseases and congenital malformations. Nevertheless, it is a little known field of research. 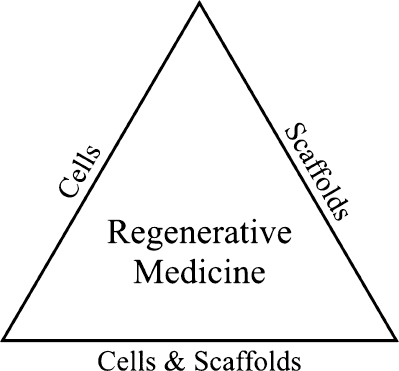 The purpose of this review is to convey the state of the art in regenerative medicine in terms of historical steps, used strategies and pressing problems to solve in the future. This review represents a good starting point for more in-depth studies and personal research projects. Diabetes mellitus is one of the oldest disorders that is rapidly emerging as a global health problem. Soy genistein is a legume that has numerous health benefits. This work aimed to study the effect of different doses of genistein on histological, immunohistochemical and morphometrical changes in β-cells of streptozotocin (STZ)-induced diabetic rats and to correlate these effects with plasma glucose and insulin levels. Fifty adult male rats were divided into five equal groups. Group I served as a control. Group II received genistein. Group III comprised STZ-induced diabetic rats. Group IV diabetic animals treated with low dosage genistein. Group V diabetic animals treated with high dosage genistein. Genistein was given for 4 weeks after STZ injection. Rats were sacrificed and pancreatic specimens were taken for light and electron microscopic examination. Blood samples were collected for detection of serum glucose and insulin levels. After diabetic induction, the islets appeared shrunken with cytoplasmic vacuolation of their cells and negative insulin immunoreaction. 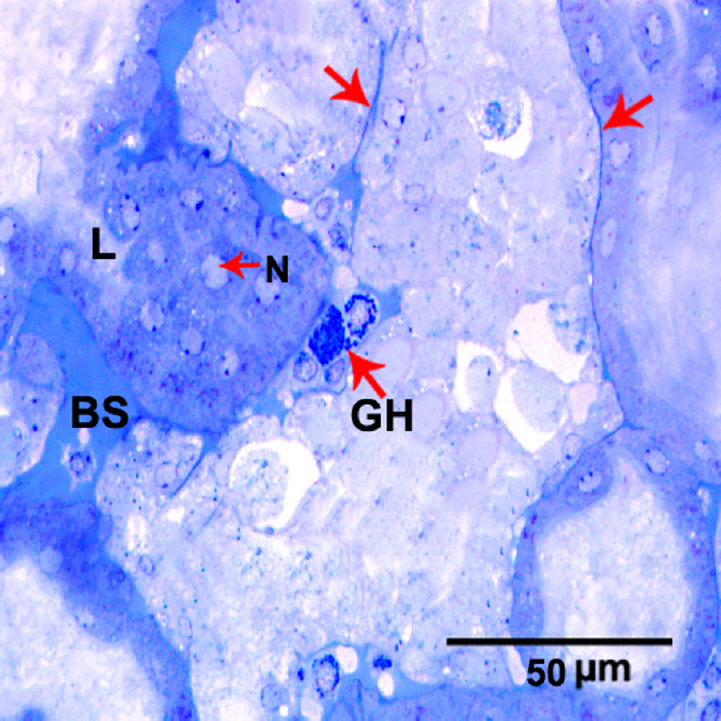 Ultrastructurally, β-cells showed darkly stained nuclei with marked loss of granules. Morphometrically, significant loss of β-cells was detected. The serum insulin level was decreased with elevation in the serum glucose. High-dose but not low-dose genistein improved the morphology of islets with increased insulin immunoreaction. Genistein also significantly decreased β-cells loss and improved glucose and insulin levels. In conclusion, genistein has a protective effect on pancreatic β-cells damage, possesses the ability to regenerate β-cells and improves serum levels of insulin and glucose in STZ-induced diabetic rats in a dosage-dependent manner. Potassium bromate (KBrO3) cardiotoxicity is not widely recognized, in spite of its well known oxidative cell and tissue damage. The wide exposure to KBrO3 in food and water necessitates finding of a simple and available antidote for its hazards like vitamin C. There are growing evidences that the regulation of redox reactions in cells is intimately tied to the levels of antioxidants. As the heart is highly vulnerable for oxidative damage, left ventricle muscle was the spotlight of our study. For this purpose 20 adult male albino rats were categorized into four groups (five rats each). Group 1 served as control; group 2 received 30mg/kg/day vitamin C for 4 weeks. Group 3 was injected intraperitoneally with KBrO3 20mg/kg/dose twice weekly for 4 weeks, and group 4 received both vitamin C and KBrO3 in the same scheme. Heart specimens were processed for various histological examinations. Sections from KBrO3 treated animals showed focal disruption of cardiac myocytes, deeply stained nuclei and dilated congested blood vessels. Ultrastructurally, irregular indented nuclei, focal lysis of the myofibrils and swelling of mitochondria were also observed. In contrast, minimal changes were observed in rats treated concomitantly with both vitamin C and KBrO3. Caspase 3 immunohistochemical reaction was nonsignificantly increased in group 3 cardiomyocytes. Semiquantitative morphological mitochondrial scoring and statistical analyses revealed significant changes between the studied groups. Finally, KBrO3 induced structural changes in rat cardiac muscle could be ameliorated by concomitant treatment with vitamin C.
Acrylamide, one of the major environmental public health problems, results from its increased accumulation in the process of cooking food materials. This study aimed to demonstrate the light and electron microscopic structural effects of acrylamide on the skeletal muscle fibers of adult male albino rat tongue and to investigate the possible protective effect of vitamin E co-administration. Thirty adult male albino Sprague–Dawley rats were divided into 3 groups, each group included 10 rats. Group I (control), group II which was subdivided into two equal subgroups: subgroup IIa: included 5 rats that received acrylamide orally once daily for 20 days. Subgroup IIb: included 5 rats that received acrylamide orally once daily for 40 days. Group III was also subdivided into two equal subgroups: subgroup IIIa: included 5 rats that received acrylamide and vitamin E orally once daily for 20 days. Subgroup IIIb: included 5 rats that received acrylamide and vitamin E orally once daily for 40 days. At the end of the experiment the tongue was dissected out for histological and electron microscopic studies, another muscle sample was homogenized and processed for biochemical estimation of malondialdehyde (MDA) and total antioxidant capacity (TAC). 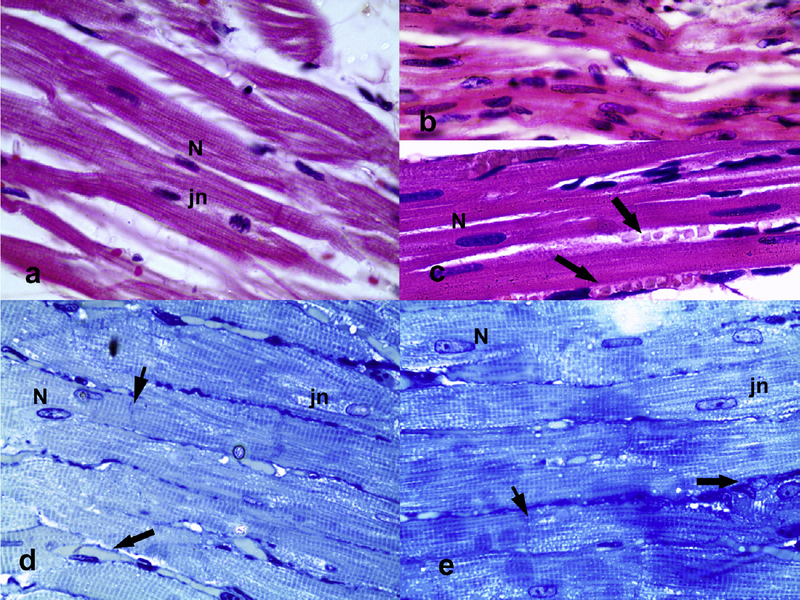 Light microscopic study of tongue skeletal muscles in acrylamide exposed animals revealed abnormal wavy course and splitting of the muscle fibers with fatty infiltration in between. Moreover, pyknosis and remnants of nuclei were detected. EM revealed marked aggregation of mitochondria of different size and shape with giant cells formation, and partial loss of myofilaments. There were statistically significant increase in MDA and decrease in TAC indicating oxidative stress in acrylamide administrated groups (group II) than the control group which increased by prolonged duration (subgroup IIb versus subgroup IIa, p < 0.0001). This oxidative stress could explain the histological changes in tongue muscles of acrylamide exposed rats. Co-administration of vitamin E with acrylamide ameliorated most of the above mentioned histological changes in the animals used and signs of improvement that became better with prolonged administration of it (subgroup IIIb versus subgroup IIIa, p < 0.0001) were detected. It could be concluded that, chronic exposure to acrylamide might lead to skeletal muscle damage in rat tongue which becomes worth with prolonged duration of exposure. Acrylamide induced oxidative stress is the implicated mechanism of such histological changes. This toxic effect of acrylamide could be minimized when vitamin E is given concomitantly with it by its antioxidant effect. The etiology of psychiatric disorders is largely unknown. A role of environmental insults during early neurodevelopment have been suggested. Infections are possible risk factors for psychiatric disorders especially Toxoplasma gondii, a neurotropic parasite with a lifelong residence in brain. This study has investigated a possible role of toxoplasmosis in the development of schizophrenia and major depression disorder (MDD). The influence of other covariates; age, gender and family history was also studied. A cross-sectional study on a total of 177 individuals, where anti-Toxoplasma IgG and IgM in sera of schizophrenia (n = 63) and MDD (n = 39) patients, all fulfilling DSM-5 diagnostic criteria, were compared to healthy volunteers (n = 55). Toxoplasma positivity was highest (31.75%) among schizophrenics followed by MDD (25.64%) and controls (14.55%). IgG levels were significantly higher in toxo-positive schizophrenics (230.1 ± 22.9) and MDD (220.56 ± 24.8) compared to controls (9.98 ±1.78). Three patients only, all schizophrenic, have positive IgM antibodies. Age and male gender appear to have positive associations to toxoplasmosis and psychiatric disorders while family history has no obvious additive role. This report is one of few linking Toxoplasma infection to MDD and adds to many suggesting a link between latent toxoplasmosis and schizophrenia. The applications of 2DE and MS have been successfully used in many studies utilising different biological samples. The complex nature of cellular proteomes is a big challenge for proteomic technologies. Much effort has been applied to develop and improve the preparation techniques for proteomic samples to be able to detect the low abundant proteins. This is one of the major and unsolved challenges facing the proteomic analysis of biological samples. One partial remedy is to deplete the proteomic samples. In this study, we compared two techniques (acetone precipitation and commercial kit) for the cleaning and purification of oviductal and uterine horn secretory proteomes in primary cell culture system. The samples prepared from acetone precipitation and commercial kit 2-D clean up kit were compared by 2-dimentioanl electrophoresis. We found that no significant difference was observed in number of spots detected between the samples prepared by acetone precipitation technique to those prepared by commercial kit. Protein samples were run through strong cation exchange (SCX) liquid chromatography in order to fractionate samples of major proteins. Protein identification by mass spectrometry revealed a significant detection of low abundant proteins in comparing to high abundant proteins. In conclusion, acetone precipitation was found to be more efficient and cost effect technique. Depletion of proteomic samples from the most abundant protein species is strongly recommended to allow the mid and low abundant protein to be detected. 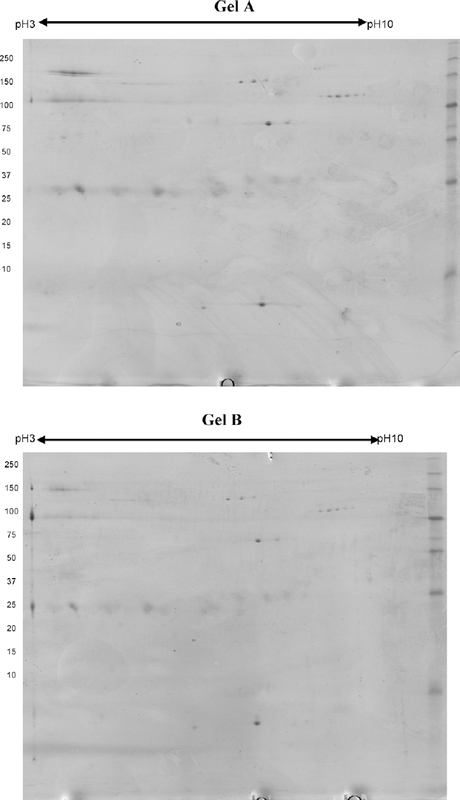 A better resolution of the gels will be achieved by removing the major proteins such as albumin and immunoglobulin. 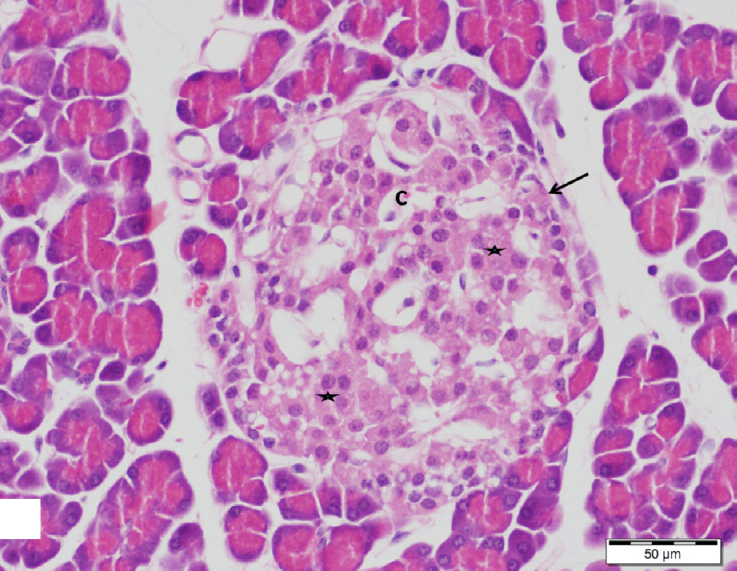 The fine structure of the premoult Y organ in the freshwater crab Travancoriana schirnerae revealed elliptical epithelial gland cells with large, eccentric, multinucleolated nuclei and ample cytoplasm. The cytoplasm showed numerous polymorphic mitochondria with tubular cristae, highly anastomosed tubules and vesicles of smooth endoplasmic reticulum (SER), rich free ribosomes, small amounts of cisternae of rough endoplasmic reticulum (RER), microtubules and was devoid of Golgi complexes. Mitochondria were of two types the more abundant micromitochondria with electron dense matrix and the less abundant macromitochondria with moderately dense matrix. The tubular SER was particularly concentrated towards the basal region of the cell, intermingled with mitochondria and dense patches of free ribosomes while the vesicular SER lie close to the lateral plasma membrane. Large vesicles with flocculent substances, a few electron dense granules and multivesicular bodies could also be noticed in the gland cell cytoplasm. Aggregations of microvesicles which appeared close to the lateral plasma membrane, in association with dilated SER cisternae and microtubules, possibly suggest the intercellular exchange of substances. The plasma membrane beneath the basal lamina was composed of invaginations and the apical surface possessed numerous microvilli which serve to increase the surface area for metabolic exchange. Towards the apical region, the lateral plasma membrane of adjacent cells was linked by tight junctions. The presence of extraordinarily abundant tubular SER, high proportion of mitochondria with tubular cristae and rich free ribosomes could well be elucidated in favour of steroid production by the gland cells.